Berger offers different grades of carefully selected sphagnum peat moss to suit every horticultural need. All of our professional peat grades are authorized for organic production. 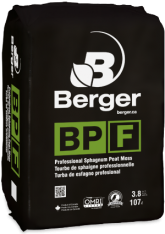 Our various grades of sphagnum peat moss (fine, professional and coarse) are adapted to all professional growing needs.